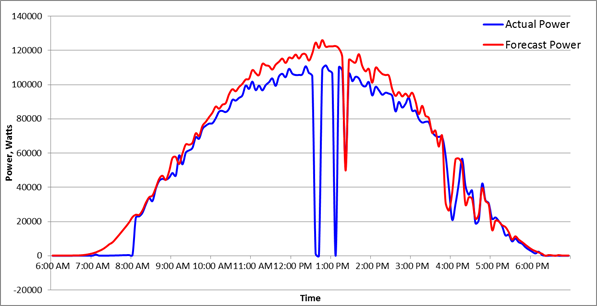 We will start by re-examining Fig-1 from the previous blog – curves (based on real-life data) of expected power from irradiance and actual measured power of 21 strings. How do we explain the gap between the two curves? The curve labelled ‘Forecast Power’ is obtained using the measured value of irradiance and the rated PV panel power. The rated power of the PV panel is specified under STC conditions where irradiance is assumed to be 1000 W/m2 and module cell temperature is 25 ºC. In our calculation of ‘Forecast Power’, we have corrected for the actual irradiance using measured values. However, we have not adjusted for actual module cell temperatures. Module datasheets specify a ‘Temperature Coefficient’ for Pmax. PV panels have a negative power temperature coefficient. This means that for module temperatures greater than 25 ºC, the power generated by the PV panel starts reducing and vice-versa. Solar plants usually employ a weather station within their site. Among various parameters measured (ambient temperature, wind speed, wind direction), these also measure the temperature of a typical module. Note that the module temperature will be different from the ambient temperature. 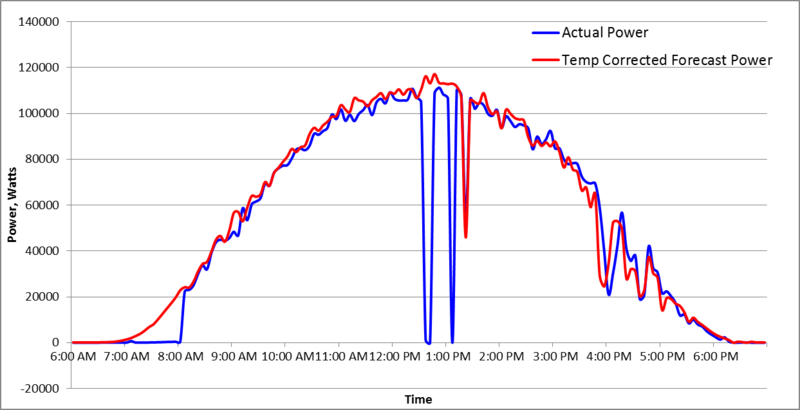 The solar plant, from which the data was obtained for Fig-1, also had measurements of module temperature. Using these measured values, we derive a new curve ‘Temp Corrected Forecast Power’, shown in Fig-2. There is now good agreement between the actual and corrected forecast power curves! Commonly, primary parameters that have significance from the point of view of real-time monitoring (in a SCADA dashboard) are included for monitoring. This example shows the benefits of monitoring secondary parameters (like module temperature), from an analysis perspective. The difference between the Forecast Power at STC and Forecast Power using actual module cell temperatures is called the ‘ Thermal Capture’ loss. 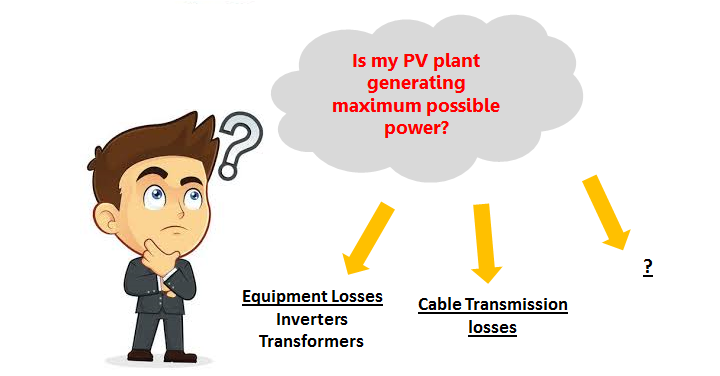 Knowing this component of the loss helps to set the right expectations of the power that should be generated by the PV strings. So, is this all? No! Not for nothing, the PV string analysis is tricky! 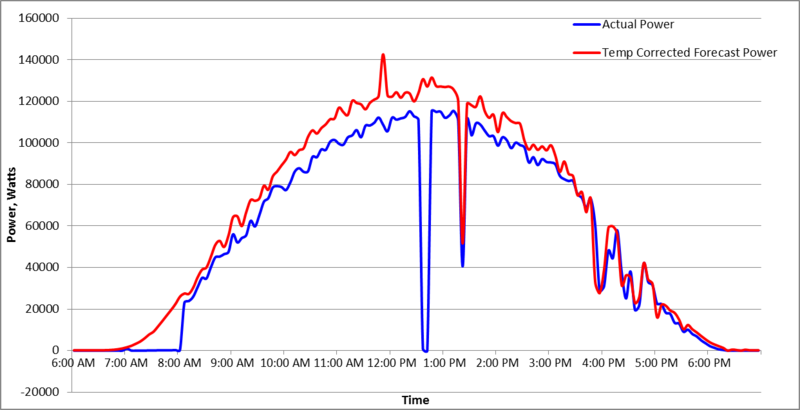 From the same solar plant, but another SMB (with 24 strings), Fig-3 shows curves of actual and temp corrected forecast powers. Clearly, there is significant gap even after the Thermal capture loss is accounted for. Other factors must be involved…we will explore them in the subsequent parts in this series… watch out for them! Did you know that Megamic’s SolarNXT software has a PV String Analysis Add-on Pack that analyses PV strings in detail? If you find these blogs useful and interesting, you can subscribe for the same using the ‘ Subscribe’ button below.